Today four of us Tamers (Steve Sutton, Chris Leger, Lynn Leger and myself) joined forces with a large contingent from the Around the Sound Jeep Club and a number of the Rainier Ridge Rams to work on the Walker Valley trails. My understanding was that the work needed today was predominantly to fix some trails where 4x4s had been running a motorcycle/ATV trail and improperly widening it. While that was true, Jim Cahill and Ryan Rettinghouse (both from DNR) had again rented a track hauler and an excavator to try to finish the work we’d started at the bridge on the EZ Valley Connector Trail last month. However, we couldn’t finish the work then because the track-hauler had broken down. As it was, ASJC ended up working with Gary Bellows from DNR to do E&E, since ASJC has done a LOT of hands-on trail work over the past year. Most of the RRR members went with Ryan to do M&O work on the widened motorcycle/ATV trail, and we four Tamers along with Kevin and Chris from RRR went with Jim to finish the work on the EZ Valley Connector as well as to look at touching up one of the bypasses on the Upper Timber Tamer Trail. The upper bypass in the rock garden had looked more challenging than desired after last month’s work—but we’d also been unable to address that then because the track hauler had broken before we could finish that job. However, since the track was trapped against the embankment, despite letting the grease out of the track mechanism we still couldn’t get it back on the cog and wheels. So, we decided to try using the excavator to lift on the bed of the track hauler to get the weight off the track and loosen it enough to slip it back onto the wheels. Well, that didn’t work so well because this excavator wasn’t powerful enough or large enough to do that with this track hauler. We decided then that perhaps using the excavator to lift the front corner of the track hauler rather than from the rear might work better. It was quite interesting to see the relatively small to medium sized excavator come up behind and beside the track hauler, use a 3/8” chain hooked around the roll cage of the track hauler, and try to tip the track hauler to the side. This helped a little, but we still couldn’t get the track pulled far enough sideways to engage it on the cogwheel. Then, we decided that a winch might be helpful to pull the track sideways to align it on the cogwheel. First, we were going to use a come-along winch that Chris Leger happened to have with him, but then we realized that Dan from ASJC had his Jeep around the corner of the trail and just above where we were! 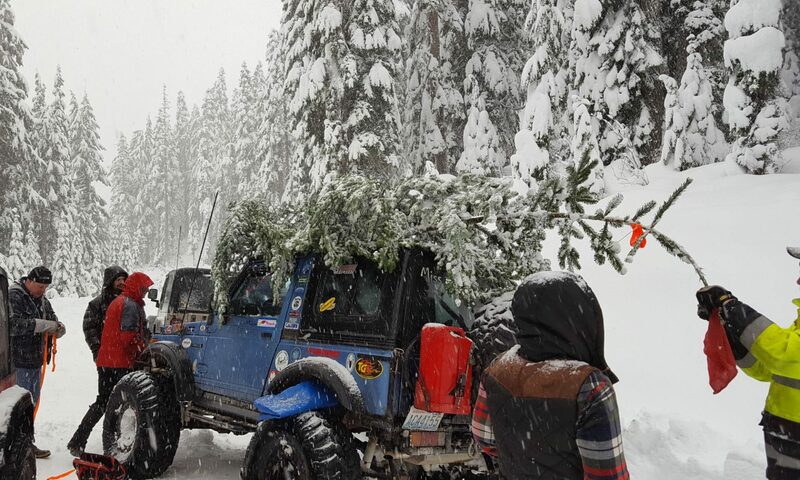 So, we had him bring his Jeep down and hooked his winch to the front of the rebellious track with a tree-saver. Amazingly, this worked pretty well, and we were able to get the track aligned on the cogwheel! A little more pumping with the grease gun (and running to Ryan’s truck for another battery for the grease gun), and then having Kevin roll the track hauler back and forth to jockey the track into position on the cogwheel, and we were home free! Kevin had already dumped his load of smaller material on the trail to try to reduce the weight of the track hauler for nudging it around. Since we’d just gotten done with all this work, we decided to let that pile of material lie in place, and called it a day for the work—especially since it was about 4:30 PM by that point, and dusk was descending. (It already had been a very foggy day, and at times on the trail the fog had the visibility was down to about 50 yards or so!) We didn’t want to chance any more loads with the track hauler, so we decided that the rocks and material that were already at the bridge were just going to have to be OK as is. (We also didn’t want to chance working on Upper Timber Tamer.) Also, being this late, we decided that we Tamers all needed to head home, and we opted not to run any trails in the dark. Our final conclusion is that the EZ Valley Connector is a probably cursed for our working on it, as we’ve now had two track haulers break in two consecutive work parties. ( also noted that each time the track hauler has broken, it was a Rainier Ridge Ram driving the track hauler when it broke—so maybe it’s not us!) At least it sounded as if the other RRR crew got their work on the motorcycle/ATV tracks taken care of pretty well, and we were able to finish the work we needed to do. All in all, a successful day of trail work at Walker Valley!